ESA (European Space Agency) ExoMars Mission left our planet on March 14, 2016. Exo refers to Exobiology, the umbrella principle of a joint ESA and Russian mission to search for methane and other trace atmospheric Mars gases that might be signatures of biological life. Designed with several objectives, ExoMars arrived mid October 2016 as primary craft TGO (Trace Gas Orbiter) and Mars lander Schiaparelli. Schiaparelli did her best, but not everything goes according to plan. Mission control’s best guess being Schiaparelli thrusters malfunctioned, pounding the lander to full fuel tank Martian oblivion at a violent 300 Km an hour. This comparison of before-and-after images by NASA’s Mars Reconnaissance Orbiter shows two features likely created during the Oct. 19, 2016 landing attempt of the ExoMars Schiaparelli lander. The small bright feature at bottom is probably Schiaparelli’s parachute, while the dark, fuzzy blob is likely the lander’s crash site. Unfazed by Schiaparelli’s demise, TGO dutifully marches a four day orbital ellipse of Mars. A carefully prescribed stretched loop ranging in altitude from 300 to 96,000 Km. Beginning March 2017, mission control will order TGO to repeatedly dip into the upper atmosphere, depleting orbital energy and shrinking the ellipse. Objective – a near perfect circular orbit at 400 Km by March, 2018. Meanwhile CaSSIS (Color and Stereo Surface Imaging System) aboard TGO returned mesmerizing first images of Mars. A feature called Arsia-Chasmata, on the blanks of a martian volcano Arsia Mons. 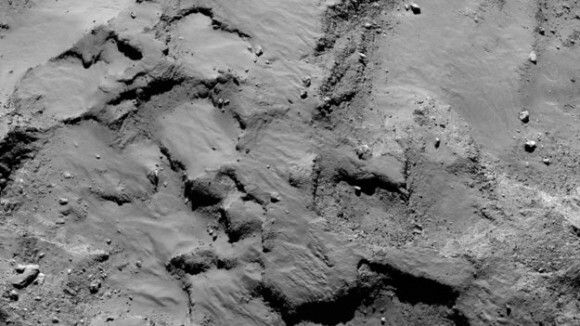 Width of this image is about 15 miles (25 km). Image via ESA/ Roscosmos/ EsoMars/ CaSSIS/ UniBE. As I write, mission control at ESA (European Space Agency) dutifully prepare Rosetta for her assisted suicide. 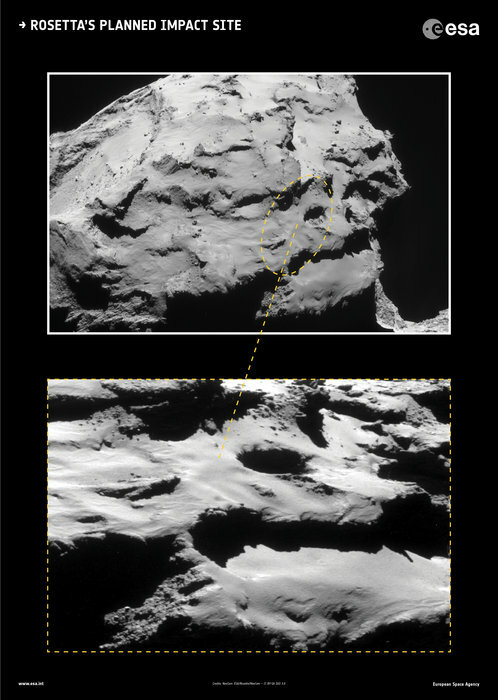 In less than 6 hours (twenty minutes either side of 7:20 am ET to be precise), Rosetta enters controlled descent into the pits of Deir el-Medina on comet 67P/Churyumov-Gerasimenko. NASA television (first link below) is airing Rosetta’s descent live. Continuing my “baby steps” campaign into the cosmos – a tireless mission, based on irrepressible enthusiasm and wonder. A cause asking readers to “look at the damn sky”. Discussion of God, religion, and creation myth are strictly forbidden – as are theories and scientific speculation. Gazing skyward – allowing yourself to replace ideological lines in the sand with unabashed “wonder” feels terrific – my pondering knees would collapse into giddy wobbles if so much as one person said “holy crap – thanks for the cosmic nudge”. ESA (European Space Authority) space orbiter Venus Express captured images of rainbows on Venus. Dubbed “Glory” – “glories “appear as circles of coloured light when sunlight reflects off atmospheric droplets – on Earth, same sized water drops – clouds of Venus contain sulphuric acid. Venus has rainbows people! 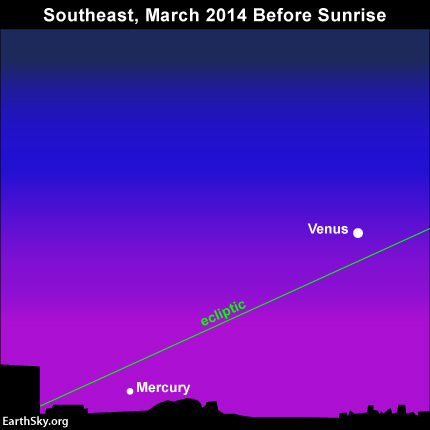 After our Sun and Moon, Venus is the brightest object in the sky. On dark nights when the Moon doesn’t steal the show – Venus can actually cast shadows. Only 650 Km circumference smaller than Earth and 80% the mass – Venus is considered our “sister” planet. First visited in 1962 by Mariner, Venus may equal Earth in physical mass – atmosphere on the other hand would squash us like bugs – 93% greater than earth and equivalent to diving a kilometer below the ocean surface. It rotates backwards, with one sluggish day 243 “earth days” from dawn till dusk. It has no moons and writhes with volcanic activity. Look at the sky and ponder rainbows of Venus. 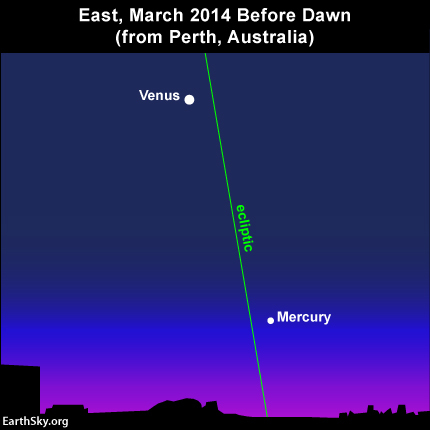 Because the ecliptic – pathway of the planets – hits the horizon at a shallow angle on March mornings in the Northern Hemisphere, Mercury sits buried in the glare of morning twilight. The ecliptic intersects the horizon at a steep angle in the Southern Hemisphere, so Mercury will be easier to see from that part of the world.